While we go haywire finding a reliable trading system, we tend to miss out on the obvious. Three indicators strategy ensures high potential profits as it produces exact entry signals confirmed by 3 indicators. Moreover, it can be used with all sorts of currency pairs. This strategy that works is based on three most popular indicators; Relative Strength Index, Simple Moving Average and Full Stochastic Oscillator. 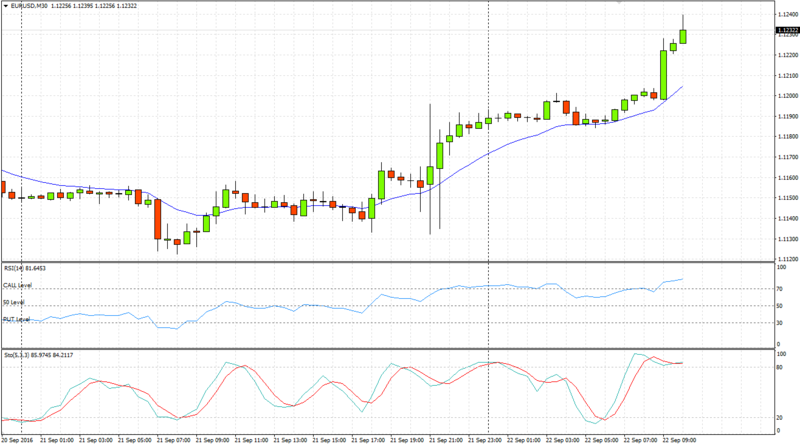 You can think of trading binary options on much higher level when you’ve integrated these indicators. However, there is no denial of the fact that every trader comes across a situation in which one indicator that is used by almost all the traders, sometimes show inaccurate signals. So, using additional indicators will help in filtering out the false signals. Read on to learn about the three different indicators that just work mentioned above. The so called ‘RSI’ focuses on the price direction, unlike the ones that mostly look at the overbought or oversold price. 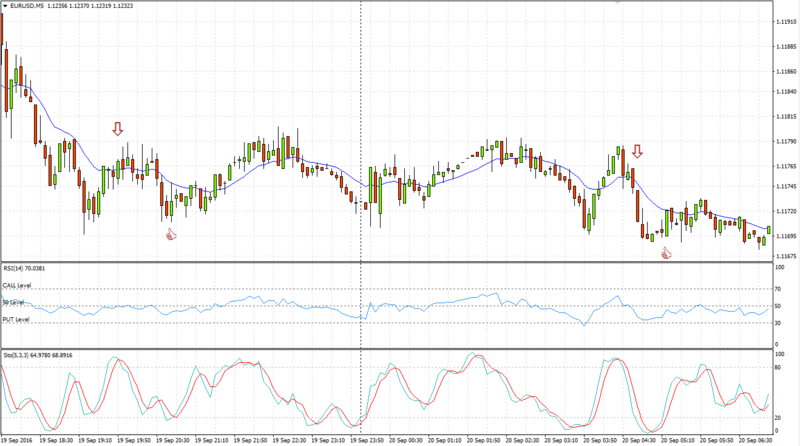 In this binary options trading strategy the RSI level 50 decides whether the trend is bearish or bullish. If the RSI is more than 50, then a rise in the price is expected. However, call option buying will occur if the RSI value is more than 50, but lesser than 70. On the contrary, buying put options is suggested if the RSI value falls somewhere between 30 and 50. Not only is it very well known for oscillation, but also for its technical analysis capabilities. The direction of the oscillator coincides with the price movement direction. You need to find stochastic between 20 and 80 as this will let you know about the present overbought or oversold asset. Different strategies developed at the intersection of Moving Average with so many different periods shows the right moment during which the market has taken an unambiguous direction, whereas the traders have decided to either purchase or sell an asset. Combining all these will result in a great strategy! In the video below, you can see a few testing trades with this strategy. Let me know in the comments if you like it! Is it non repaint arrow ? back testing a strat, using indicators will often show good results, but they are all lagging, in real live trading they dont work. what timeframe and what time of expiration i must to use ? is it 5min chart and 10min expiration ? Can I just confirm the setting on the moving average please. I also assume it is 5 min chart and 15 min expiry?? If what on the video, it look like M10 expired. Cause if wait for the first candle closed we have to count for next 3 candles. The strategy is ok ,but i dont understand it can i have 1-1 training on the strategy pls. Which timeframe should be used for 5 minute expiries, 1M? I want to try this strategy as it looks very accurate. Will update with any results. with EUR/USD 5mins data (London session) in April 2017. The accuracy is around 55%. What moving average is used here, please? that means it’s good in high volatility markets?